One of the questions I get asked the most often is how one gets started in astrophotography. More specifically, what kind of equipment is required in order to take images like I do. In this article, I’ll try to clarify that. Note that this won’t be covering technique or procedures in any way, but rather just what you need to get into it. Each of these types will require vastly different equipment and techniques, as well as software and technique for post processing. I’ll be covering each of these 3 types and what is required to get the best results. First off, for those that don’t know, I’ll give a brief explanation of what the aurora borealis is in layman’s terms. The sun will occasionally discharge large clouds of plasma in the form of a solar flare. 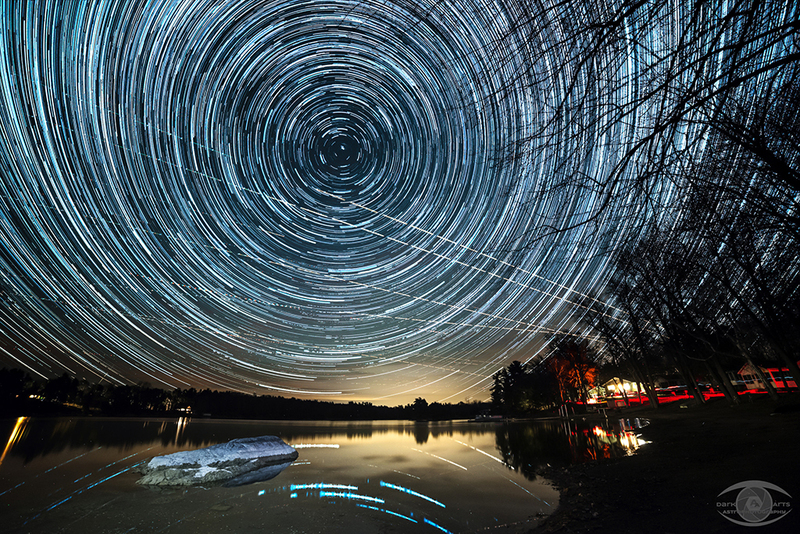 Occasionally, the Earth intersects the path of these flares and collides. When this occurs, the plasma is swept up by our planet’s magnetosphere. The charged particles of plasma get directed to the north and south poles. 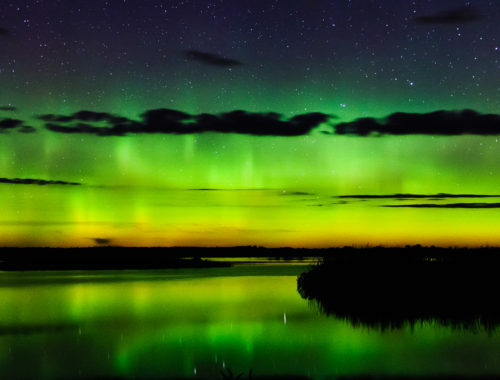 When they collide with the atmosphere, they glow and can be seen as aurora. Intensity of auroras can vary on many factors, but the main contributor is the size of the flare that hits us. At the time, this was normal for me. Growing up, my interest in the sky was minimal. I took the aurora for granted. I had no way of knowing that the opportunity to see such dazzling light shows was NOT the norm everywhere. It was the status quo for me, because it was all I knew. And having dark skies was also the norm. The town I lived in was quite small and isolated. Other than ambient lighting, there was very little in terms of light pollution. If only I could have regular access to skies like that now! In my teens, my family moved to a small country town in eastern Quebec where light pollution was also very minimal. Being much farther south, the aurora was far less frequent. This is where I came to the realization that regular auroral shows were not the norm everywhere. I was still under dark skies all the time though. But wasn’t into astronomy or photography at the time, so didn’t appreciate the “gift” I had.Fast forward 30 years and I now live in a medium size city in eastern Ontario. I have to contend with light pollution. Although I’m luckier than most urban amateur astronomers. Our light pollution here isn’t terrible compared to most cities. I also live in a suburb on the northern perimeter, so I only have bad sky glow due south. And I have a couple of spots just out of the city that I can quickly get to within a 10 minute drive that will give me reasonable darkness. But if I want a truly dark sky, I need to drive about 45 minutes north to the Lennox & Addington Dark Sky Viewing Area.And this is where I was on Friday, Sept 12, waiting for the aurora and my first chance to capture images of it. Usually, this site is quiet. I’ve been there several times over the course of the summer. At most, I think I’ve see perhaps a dozen people there at one time, and maybe 30-ish people would show up and leave over the course of the evening. My rough estimate for Friday was well over 100 people showed up, with my rough head count estimate of perhaps 40 people there at any given time. Many people came from the Toronto area (a 2+ hour drive) to see the aurora. Some people came from as far as Hamilton (a 3 hour drive). However, most left disappointed. Turns out the Toronto-area news told everyone the aurora would be visible between midnight and 3 AM. So many people showed up between 11 and midnight. Unfortunately for the them, the aurora made its appearance at about 9 PM and was visible for all of 10 minutes or so. 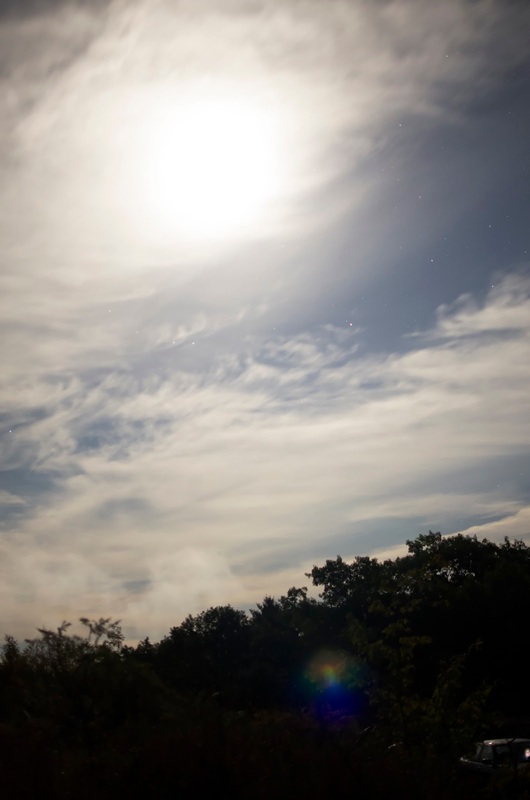 And clouds rolled in shortly thereafter and then the moon rose. Of everyone that showed up, I think only 2 people managed to get any images of it at all. And I was one of those! I knew better, so I was there before sunset. I had my camera set up on a tripod and had my scope set up hoping to do some deep sky imaging if the aurora didn’t make a show. I was prepared. When the aurora finally did show, most of the people there didn’t even realize it. It started as a green glow on the northern horizon. 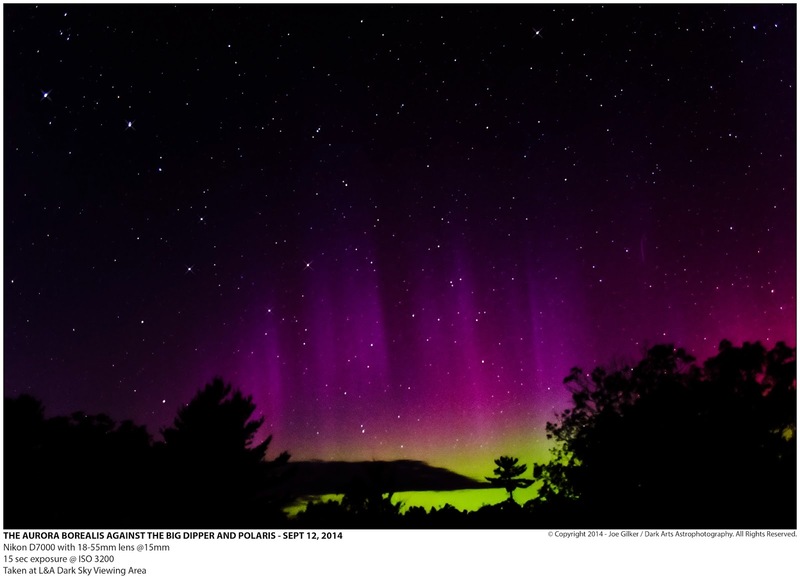 I pointed it out to people, and heard some saying that it wasn’t the aurora, but light pollution. Being mostly city dwellers, they didn’t realize that the northern horizon at this site is pristine dark sky. North of this site is nothing but wilderness and a few scattered small towns for hundreds of kilometers. This was most definitely the aurora. It’s only when hints of purple and blue started showing up higher above the horizon that people really clued in and realized what they were seeing. It’s too bad that it only lasted 10 minutes, because it really was a beautiful show, even though it wasn’t very intense. I was grateful to finally see an aurora after so many years of not seeing one. The evening was not without its problems though. I missed the peak of the display due to camera focusing issues. I had the camera trained on Arcturus trying to get my focus, and for some reason, I couldn’t. I had clicked the lens to manual mode before attaching it to my camera, but it appears that when I put it on, I hit the switch knocking it back to auto mode. So I was fighting the auto focus without realizing it. While I was doing this, the aurora was at its peak. When I finally realized what happened, fixed, got trained on the aurora and started shooting, it was already receeding. I managed to get 5 pictures before it faded away completely. Of those 5, only 1 had decent detail. And I share that image with you now. Once the aurora display died down, I tried to get some deep sky imaging. I wanted to get a good shot of the Ring Nebula with my now working 8″ SCT instead of the 120mm refractor I’ve been using all summer. I wanted to finally put my little light bucket to work. After finding my target and taking some time to frame it properly with test shots, the clouds decided to make an appearance, and I wasn’t able to take any images at all. However, I did manage to take 1 nice test shot of my subject. I’m quite pleased with the results considering it’s a single 30 second sub without any calibration frames. It just goes to show how good imaging can be from a dark site! 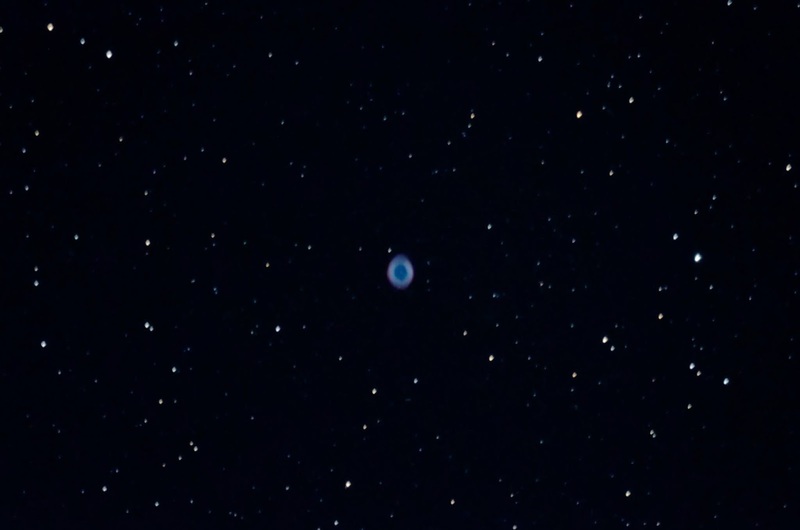 M57 – The Ring Nebula. Single 30 second exposure, no calibration frames. So with too many clouds and a bright moon in the sky, I decided that I would try something I hadn’t attempted before – time lapse photography. I had a bit of an idea how it worked, but had never attempted it. So I figured it would be fun to try out. I popped on my 35mm f/1.8 prime lens and targeted the moon. I figured it would be a nice backdrop for time lapse. While testing out settings, I snapped this pic I entitled “Daylight at Midnight”. It was shot as 12:03, but with my aperture fully open, the resulting image was so bright it looked like it could have been taken mid-day instead! It even came complete with a lens flare. It wasn’t my intention, but I thought the image looked rather cool nonetheless, so I kept it. So after finding some good settings, I set the intervalometer and let the camera do its thing over the next couple of hours and pointing at different areas. The resulting time lapse isn’t fantastic by any means, but considering this was my first attempt, I’m pretty pleased with the result. It was fun to try out, and I’ll definitely be trying this more in the future. The video can be seen here on YouTube. So until next time, clear skies to all. © Copyright Dark Arts Astrophotography. All Rights Reserved.